Strawberries and feta crumbles do their sweet and tangy dance in this terrific spinach salad for six. Beat vinegar and mustard in small bowl with wire whisk. Gradually add oil, beating with wire whisk until well blended. 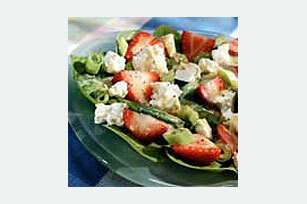 Toss spinach with strawberries, onions, cheese and poppy seed in large salad bowl. Add mustard dressing; mix lightly. Substitute raspberry vinegar for the balsamic vinegar. Dressing can be prepared ahead of time. Store in refrigerator until ready to serve.